Hub hole ID approx 3 3/8"
Lug hole ctr to ctr 3"
Wheel drum Cover approx 10 1/4"
Wheel Rim width approx 4"
Tire Inside rim width approx 3"
Alsancle, did you find your answer for the wheels. If not I can measure up my wheels next time I am beside my Royale. Hi Kirk, wheels were posted over on the aaca forum and they looked vaguely like Royale wheels. I was just wondering if they were. I guess not. I compared them with a picture from Victor's parts pictures and these are 5 lug vs Royale 7 lug. As you know Royale Wheels are quite unique being 7 lug, 18 inch that fits up to the 15 inch brake drums. 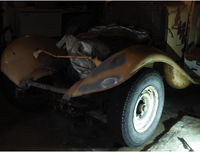 I searched out a method that would work for a rolling chassis, with modern tires while we restore and paint the original rims. 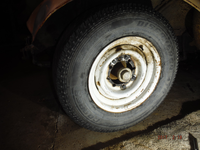 I used GM, 3/4 ton 6 lug truck rims, enlarged center and added two(2) extra holes that line up to the Royale Drum. Purchased 9/16 x 3 1/2 inch trailer spring bolts, added 2 1/2 spacer behind the rim, bolted up 4 per tire, vwalaa!! It worked Great, towed it to the new garage and we have a rolling Royale. It has that Street Rod look, I prefer the Original though.